Washi tape is a rice paper tape that originated in Japan. It is both pretty and versatile. I used it often in my card making, but now frequently use it in my Bible journaling to add interest or as a way to reinforce the page. I have occasionally used it to fix my broken pencils or to decorate an envelope. Where to Buy Washi Tape? You can buy washi tape at any craft store, such as Michaels, Joann, and Hobby Lobby. You may even be able to find it at the dollar store. Many shops sell it online as well. You can use our ministry affiliate link to support us with your purchase. Click here to take a peek at the wide variety available on Amazon. 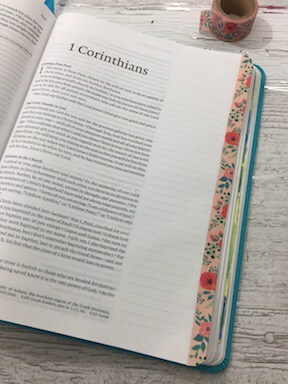 Why Add Washi Tape to the Edges of Your Bible? 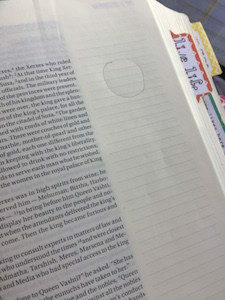 There are many reasons why you might want to add washi tape to the edges of your Bible. 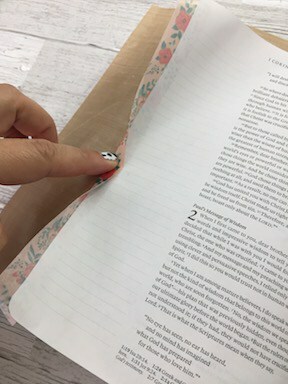 Mark Your Progress: You can use washi tape to mark the progress of your reading. If you’re reading through the Bible chronologically, then you would mark Genesis first. You could mark Exodus after you finish reading Genesis. This helps you know exactly what chapter you are currently reading. Create Interest: I’ve seen entire Bible journaling entries created with washi tape. They really are beautiful. I’ll usually add a little washi tape on the bottom or top of a page to add interest. Bookmark a Page: Some people use washi tape as a bookmark, flag, or tag at the top of the page. Anything you can do with a sticker, you can do with washi tape. Step 1: Measure your washi tape and mark the center. In the picture below, the center is 1 cm because the washi tape width is 2 cm. Step 2: Using a ruler, measure 1cm from the edge of your page. If your washi tape is a different size, use the measurement from step 1. Draw a line down the page using your ruler. Step 3: Place a craft mat or other slick surface under the page you are taping. 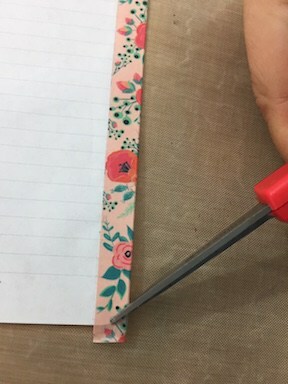 Then place the washi tape next to your pencil line or slightly to the right of it. You’ll want to erase the pencil lines later especially if you have a light colored washi tape. Step 4: Run your washi tape completely off the page as shown in this picture. Step 5: Turn the page over and move your craft mat to the other side. Fold your washi tape over the page starting in the center and moving out towards the edge. Step 6: You can see the edge of my Bible page in this photo. 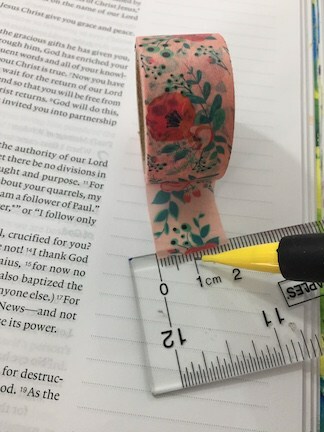 That makes it easy to trim the washi tape to match the Bible perfectly. 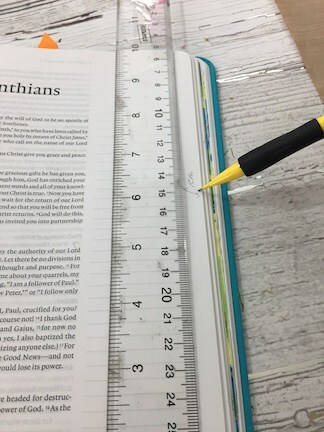 If you can’t see the edge of your Bible page, use the next page as a guide as you trim. 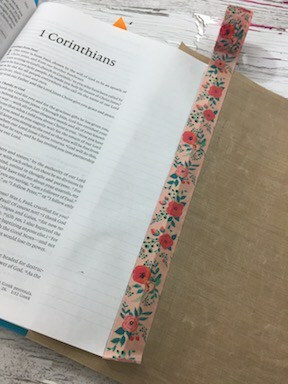 Applying washi tape to your Bible is a matter of preference. As I always say, there is no right way to Bible journal. The right way is your way! As long as you spend time in Word and with God, that’s all that matters! What do you use washi tape for? If you are new to Bible journaling, you might be interested in our free beginner’s course. This 10-day course will help you get started with exactly what you need (hint: you probably already have it) and provides simple tips and tricks to get started. I’m in LOVE with the paper napkin art I’m seeing in Bibles these days. I saw a lovely video by Miss Tracy (video below – not me – I’m TRACIE) and was inspired to try it in my Bible. Unfortunately, I couldn’t find her napkin!!! Apparently, it’s a seasonal Easter napkin. When I can’t find what I’m looking for, I’ll often fiddle around in Adobe software to try to come up with an alternative. Obviously, copying is a no-no, so I make my alternative version different using alternative fonts, colors, words, and images. Often, I’ll discover that I like my version better than the store bought. I feel the same way about my mom’s food too by the way. Much better than store bought! Sadly, I no longer live under her roof, so I always ask her to make me something special for my birthday. To learn how you can get this digital paper design, visit our website store here. Your purchase in our store using our ministry affiliate links in this post helps support our ministry. Thank you! How Much Does Paper Napkin Art Cost? Paper napkin art can be expensive or cheap depending on how you look at it and where you’re looking to buy it. You can buy paper napkins at the Dollar store in packs of 10-24 count depending on size. I’ve seen them as high as $4.29 for a pack of 16. To apply it, you’ll need gesso and a makeup sponge or paint brush. Assuming you get them at the dollar store and use one napkin per project you can create a beautiful piece for as little as 5 cents. Amazing! Now you need to find someone to swap napkins with or use those napkins at your next luncheon. It’s a great excuse to have some friends over! The problem that I have with paper napkin art isn’t the cost. It’s the availability of designs and having to buy 10-24 of the same napkin for one project. When it comes to availability of d esigns, there aren’t many Christian stores left here in Phoenix so I stalk the Dollar Tree because they often have Faith-based napkins during Easter and Christmas. Sometimes they have them during the year as well. Once I buy napkins, I usually only use the design once. Instead of costing me 5 cents per project, it ends up costing me $1-$4.29! 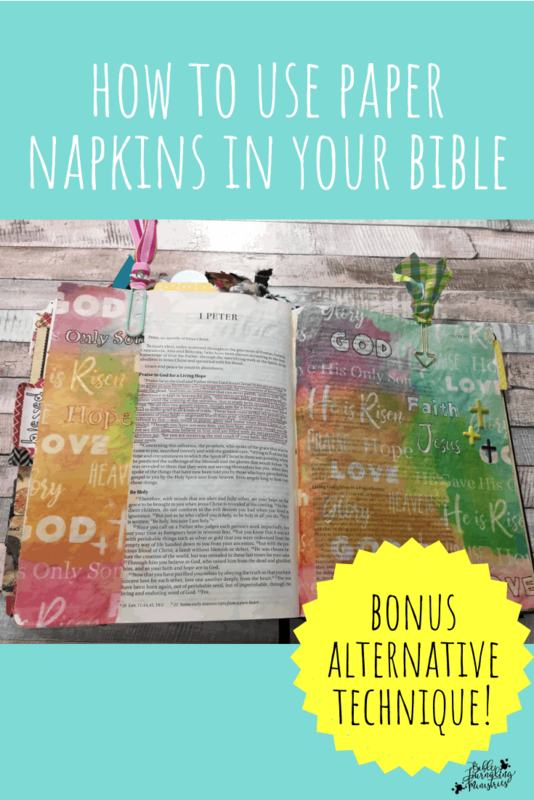 I’ve joined napkin swap groups – a great alternative, but I still have to ship the napkins. Sigh. In search of an alternative, I saw that others were using gift wrapping tissue paper in lieu of napkins so I experimented with many techniques until I found one that worked best for me. I purchased a pack of tissue paper from the dollar store and purchased a few images that I liked off the internet. By the way, you can find free images on sites like pixabay so don’t pull random images off the Internet without checking to see if they are indeed free. Use a site that’s reputable and put some food on the artist’s table if it’s not free. Classic white tissue paper comes in 35 sheets at the Dollar Tree and you can cut each sheet to make a little over three 8 1/2 x 11 sheets. According to my calculations, that’s less than .01 per print. Of course, you have to print out the sheet, so I use a scrap piece of copy paper and my pages cost 3 cents per print using the HP Instant Ink service. Add in the cost of repositional herma dots and each paper napkin alternative cost me about 5 cents. Not bad at all! Plus I don’t have all these extra napkins. I just have to say it…I love the HP Instant Ink service because my printer tells them when to ship the ink and I never have to worry about reordering. I always have it when I need it! Pages roll over so if I don’t use them all, I can use them the next month. I didn’t think I’d use the service as much as I do, but alas, I’m now spoiled and love it. To print on tissue paper, you’ll need a printer. I use an HP Envy Wireless printer. You’ll also need the tissue paper and either washi tape or repositional tape. Here’s the video that shows you exactly how to do it. Cut the tissue paper so you have the design you’d like to place in your Bible. Make sure you put down at least one coat of clear gesso. I usually do two coats just in case. Let the gesso dry between coats. Once your base layers are done, apply one more coat of clear gesso and lay the tissue paper on top of it while it’s still wet. Let the layer dry or carefully use a heat tool to dry it. Then apply a coat of matte medium over the design. I use matte medium because it’s less gritty than the gesso and dries with a nice smooth finish. You can draw on the design once it’s dry, but make sure you clean the tip of your pen afterward. That way you remove any gesso or medium that’s attached itself to your pen. I swipe my pen on a paper towel after every stroke to ensure I don’t pick up any medium. Both mediums will dry out your precision pens so use them with caution. Gel pens are a great alternative! Miss Tracy (not me) created this video that the gals over at our Beginners Facebook Group love. It wouldn’t be right to create this post without sharing the technique that’s inspired so many. Our techniques are different, but they work just fine! 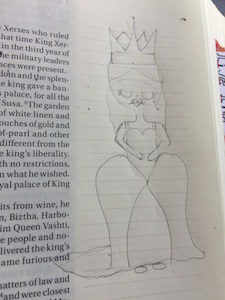 Have you tried paper napkin art in your Bible? What do you like best or least about this technique? I’d love to hear your thoughts in the comments below. 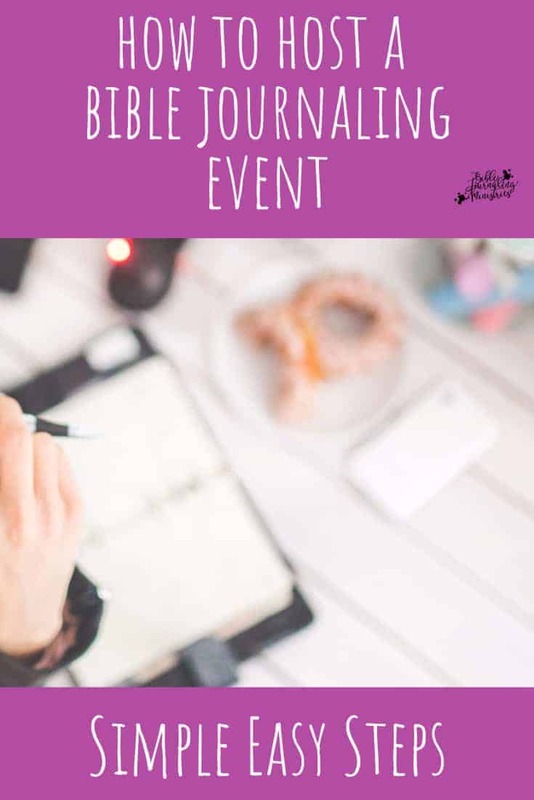 Have you been thinking about hosting a bible journaling event? Good for you! It’s fairly easy to pull together a successful Bible journaling event if you’re inspired and committed. There really isn’t a better way to bring your favorite Scriptures to life, surrounded by like-minded people. Together you’ll learn more about the process, all the while enjoying each another’s company. 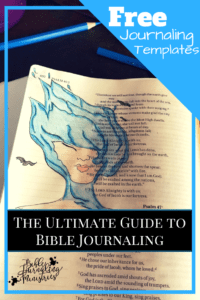 Here are a few ideas that will help you host a great bible journaling event. Before we begin, make sure that the people you understand what Bible journaling is about. You can take our Bible Journaling for Beginners class absolutely free. Creating, posting and sharing a few photos of bible journaling prior to the event will help. Hosting any kind of event is more fun and a lot easier if you have a friend you can partner with. Together you can divvy up tasks like responding to RSVPs, picking up snacks and drinks, supplies and more. Setting up an event without a partner isn’t impossible, but it’s is a lot easier if you can get help before, during and after the event. First of all, let anyone you know who is new to bible journaling that, while they’re nice to have, it’s not necessary to have a Bible journal – even a standard notebook will work. 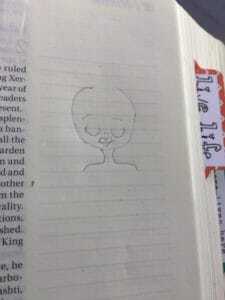 That said, most eventually switch to a “journaling” Bible with wide margins or blank pages like the interleaved Bible. To learn which Bible is best for you, try out our Bible journal selection tool. Next, have everyone bring a few things like watercolor pencils, colored pencils, stickers, stamps and stamp pads, glitter glue, Washi tape, etc. You can also have some extra supplies on hand and you can actually find a lot of great supplies at your local Dollar store. When it comes to supplies, the more the merrier. You could also charge a small fee per person, say $5 each, if you need help covering costs. It’s easier if you have Scripture available so the entire group can study the same thing. Consider using the main message from your church so that everyone is familiar with the lesson. If you have samples or know someone who Bible journals frequently, have a few examples available at your bible journaling event. Our Pinterest page has many samples sorted by the book of the Bible to help provide inspiration. Sharing your examples with your guests will help inspire them. It’s also a good idea to have supplies that you used to create the example available as well. You can host your bible journaling event just about anywhere including your home, your church, the library, local scrapbook store. During nice weather, you can meet at a local park that has picnic tables and maybe a playground for the kids. Here are a couple of things to share with your friends who plan on attending your Bible journaling evening. 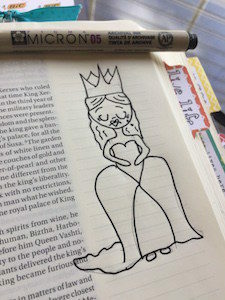 They don’t need to be an artist to Bible journal – just inspired. Can’t draw? No problem – just use stamps and stickers, trace designs or use Washi tape. You don’t need fancy supplies either. 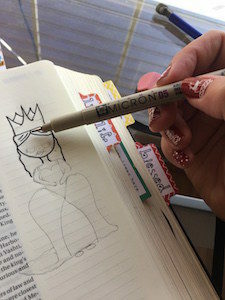 The fact is that the best Bible journaling isn’t forced. It comes from reading, and being inspired by, God’s Word and each other. 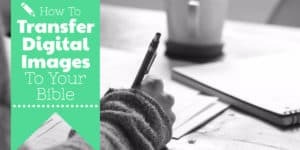 Using the tips mentioned here will help ensure that your bible journaling event is a success. By success we mean that you have a wonderful time with awesome people, sharing their love of God through collective, artistic inspiration. The Gel Press is a pretty neat tool that’s used in mixed media. I hadn’t given it much thought until I saw Keri Salle Bible journaling with the Gel Press at a booth I passed by during a recent conference. I loved what she was doing and decided to give it a try myself. I purchased a few sizes and gave it a whirl. What is the Gel Press? you might be wondering what is a Gel Press and how you can use in your Bible. A Gel Press is basically a piece of gel that’s used for mono printing. Mono printing is when you print an image once. You can never get the same print again. It’s one image and every image is different. The Gel Press is really flexible and flimsy. It cleans up pretty good with just a little bit of water. They come in multiple sizes. In the tutorial below I use a 5”x7” piece. 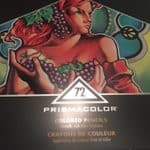 To use the Gel Press, just add a little bit of acrylic paint to the surface and go over the paint with your brayer to spread it out. Just start to mix the paint here and there and blend it if you want to. You don’t need to clean the Gel Press before you start using it. A lot of people like to use it without it being super clean. It’s entirely up to you. Once you’re happy with the paint mixture, place your stencil down and roll over it again with your brayer. Of course everything is optional. You don’t have to run the brayer over. If you don’t, you’ll get a different look. Once you’re done, lift the stencil up. Alternatively, you could place the stencil on the Gel Press without the paint. Then put the acrylic paint on the stencil. It’s totally up to you. And that’s the fun of the Gel Press! You can put different colors and different designs on it and you’ll get a different print every time. Protect your Bible by placing a craft mat under the page. Then place the Gel Press on your Bible journaling page. Press down. When you’re ready pull the Gel Press away from the page. Be careful because you don’t want to rip your Bible page. This is the fun part this is the fun part because you never know what you’re going to get! I don’t gesso the page whenever I’m working with acrylics just because I never have problems with it seeping through to the other side. If you’re concerned about it Bible journaling with the Gel Press, feel free to prep your page. 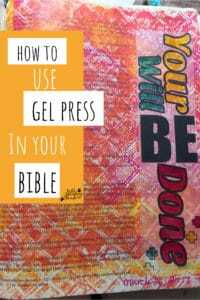 Bible journaling with the Gel Press is lots of fun and is a simple way to create beautiful art in your Bible. Because it’s so easy to use, you may find yourself with more time to spend in the Word. Give it a try! Stickers are easy to use and very affordable. 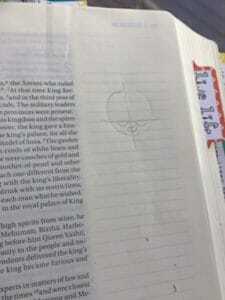 But is there really a technique to using stickers in your bible? Absolutely! 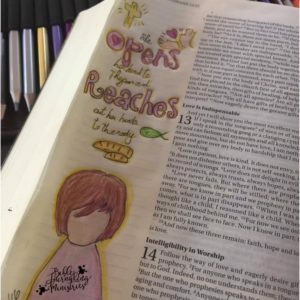 From selection to creation to placement, this could be the easiest technique you learn in your Bible journaling journey. If you already have a stash of stickers, that’s awesome! Use what you have, but first, make sure that the stickers are acid-free before you place them in your Bible. If you’re purchasing stickers, look for designs that you love, ones that complement your study, and try to get them on sale! Many craft stores often offer discounts, sometimes up to 80% off! Avery Clear Stickers 8 ½” x 11” for Inkjet Printers – 25 pack – http://amzn.to/2kHkWdj. Notice how you can see the words behind the clear sticker in the image above. You can’t see the words behind the white sticker, but it’s much brighter and crisper than the clear sticker. Some people use labels that are acid-free. They’re fine to use, but they are sometimes hard to peel away from the backing. Using a simple software tool like Word, you can open a new document, insert pictures or images, create words in many different fonts, add colors, and draw lines and shapes. You can also make stickers out of your family photos. Just add as many as you can to the page and print them out on the sticker paper. Make sure you use the best printer settings so you get nice crisp images. Once your stickers are printed, you can use scissors or punches to cut around them. Some people are super crafty and use a tool like the Cricut or Silhouette that allows you to print and cut at the same time! What a time saver! 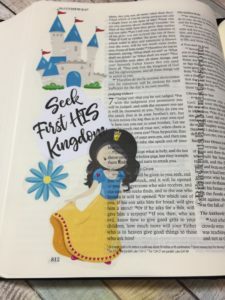 There are a number of designers that provide stickers and margin elements specifically for Bible journaling. Some of the designers even provide them for free. You can find a comprehensive list of freebies on our website. Story Telling – Use stickers to tell the story of the Scripture or how a particular Scripture impacted your life and those around you. Main Focal Point – Use stickers to emphasize the important parts of the Scripture that you’re studying. Make them the main focal point of your design. 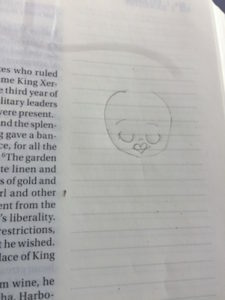 Border – group stickers along the margin of your Bible as a border between the Scripture and your journaling, doodling, or other art. Accents – Use stickers to accent a main focal point, like a particular Scripture, your journaling art, a picture or other ephemera. You can use them on the corners, on the sides, or in a design that directs the eyes to the focal point. Clusters – Use a few stickers as a grouping rather than randomly placing the stickers. Group a few flowers or other similar objects together. Designs – Use stickers in a design like a swirl, arrow, or a word to create interest. Path – Use stickers in a path to direct the reader’s eye to something you want them to see. Framed – Place the sticker on cardstock that’s cut bigger than the sticker. This creates a framed effect. Then adhere the cardstock to your Bible. Randomly – Use stickers randomly; however you feel called. Remember, there are no rules to Bible journaling. Always make sure your stickers are where you want them before you peel off the back. Once you place them on your page, they are almost impossible to get off. Once you are satisfied with your layout, peel the backing off the sticker and carefully stick it in your Bible. It’s ok to change your mind before you adhere your stickers. You can also journal around stickers, add doodles, or paint the background as well. 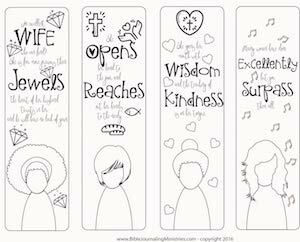 Making paperclip bookmarks for Easter Bible journaling entries is simple with these fun Easter Stickers. In the tutorial below I show three different ways that you can create beautiful bookmarks to celebrate this day. You can download the Easter stickers this month for free! Click here to download our latest freebie. If you missed this printable while it was free, you can still purchase it using the link below. 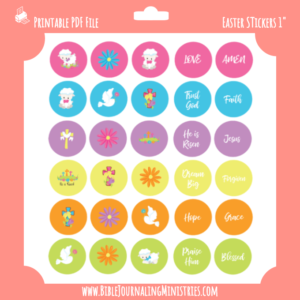 Download the printable Easter stickers. Print them out in color on your printer using cardstock. Place the sticky side of the laminating pouches or tape on the front of the image. Using the 1″ circle punch, punch the images out. Using the hot glue gun, place a small dab on the back of one of the stickers. Place the paperclip on the glue and press down. Adjust the paperclip so that it’s in the position you’d like it to be in. Glue another sticker on top of the paperclip so that it’s a double-sided bookmark. You can use the Xyron sticker machine to give it a nice seal. If your using these stickers as stickers, follow the instructions above minus the paper clip. You’ll have a nice glossy sticker to place in your Bible. Place the stickers on cards, in your planner, or decorate a gift bag. The possibilities are endless. You can make these paperclip bookmarks for Easter for yourself or for a friend. They make perfect gifts! Who will you gift them too? 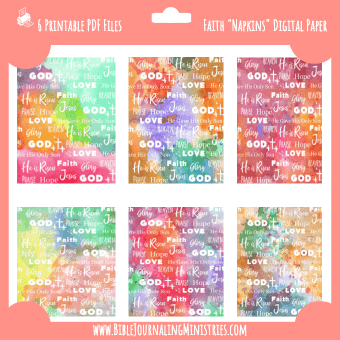 In this tutorial, you’ll learn how to make Bible tabs out of scrap paper or by using our free printable download: click here to download the file. Supplies used include our Bible tabs printable, tape or Xyron sticker maker, and a tab punch. Step 1 – Print out the tabs using a color printer and cardstock paper. Step 2 – Cut out rectangular tabs. Step 3 – Fold the tabs in half. Step 4 – Place the tabs in the tab punch with the fold slightly under the edge of the tab (see video). Step 5 – Press down on the tab punch. Step 6 – Using a sticker maker run the tab through the machine with the printed side up. If you’re not using a sticker maker, you can use tape or glue. Step 7 – This step is optional and not included in the video. But we highly recommended it. 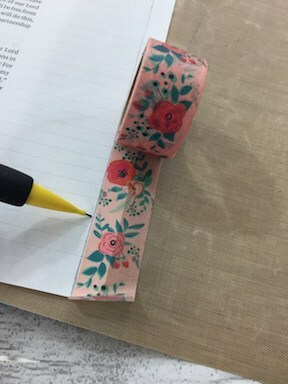 Place washi tape on the edge of the page to reinforce the page. Step 8 – Place one edge of the tab on the Bible page and fold the other side over. 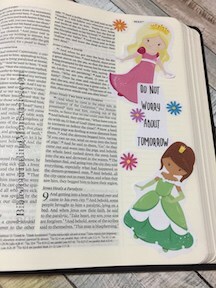 If you decide to use scrap cardstock paper for your bible tabs, you can write words on them using a sharpie or gel pens. You can also use labels, stickers or stamps as well. Let your imagination run wild. You may also want to laminate your tabs to help them stand the test of time. You can use these tabs in other places besides your Bible. Try using them in a planner, cookbook, notebook, and on files. There are so many uses for bible tabs! How do you use bible tabs? I’d love to know in the comments below! Please note that if you purchase a product using our affiliate links in this post that we may receive a small commission. This helps our ministry stay afloat. Thank you so much. Being an avid stamper, I often purchase stamps or digital images of girls for cards and other projects. I love whimsical girl stamps and have always wanted to try my hand at drawing one. 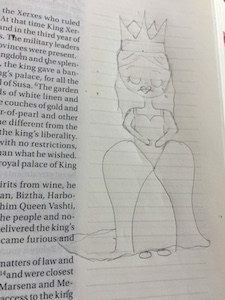 After I gave it a go, I realized that its not as hard to learn how to draw girls of the bible as I thought it would be. My process is below in written and video form. 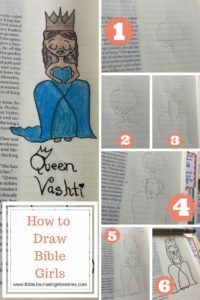 I also share the story of Queen Vashti for those who want to learn more about this little known figure. You can view our favorites here. Draw a circle slightly larger than a quarter. Add cross hairs on the circle slightly below the center. To create the eyes, draw two semicircles on the horizontal line of the crosshairs. To create the mouth, draw a heart below the eyes on the vertical line. Erase the cross hairs and redraw any of the face characteristics that you accidentally erase. Add a small semi circle upside down as her nose. Add her neck and shoulders by drawing a line from her head and curving it out horizontally. Create her dress by drawing two lines straight down from her shoulders. Then flare out her dress by drawing a few curves similar to angel wings. Arms are the hardest part so you may have to erase a bit and try a few times. I start from her shoulders and come out almost making an odd shaped “L”. I round off her hands before I erase the dress that you can see through her arms. 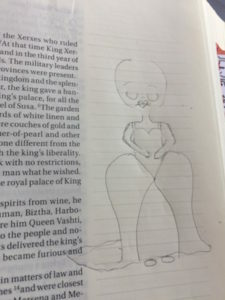 I decided to give her a frown because I think Queen Vashti would have been very sad to lose her crown. To draw the frown, just reverse the line through her heart mouth. Instead of making a “U”, it is now an “n”. Add details like the skirt opening and flowing dress. Her shoes are small ellipses. Add her hair and crown. The points on the crown should be smaller than the points on the front. That’s because they’re farther behind on her head. It helps create perspective by making them smaller. Add lines for her hair. There’s no need to draw a ton of individual lines. A few darker lines will do just fine. Outline your drawing with a micron pen. I’m using 05 because that’s what I grabbed. You can use a smaller pen tip size if you prefer. Erase the pencil marks before you color with pencils. Otherwise the gray carbon will mix with your vibrant colors. Color her in. I used Prismacolor pencils. I hope this tutorial was useful. You can view a list of recommended supplies here. Xerxes is a powerful king. In the beginning of the book Esther he’s holding a banquet for the nobles, prinses, and military leadrs of Persia and Media. Queen Vashti holds a banquet for the women of significance. When the kings is intoxicated on the seventh day of the party, he summons the queen with her crown to display her beauty (at the party). The Bible doesn’t share details as to if she’s to be naked or not. Queen Vashti refuses the king, which embarrasses him in a time when he’s trying to rally the troops to go to war. This is a big deal. She’s not just a wife, but a queen. Her refusal is a public event with political implications. It’s possible this is the earliest significant stand for women’s’ rights. Xerxes consults the nobles and make a decision to depose of her. After all, they didn’t want all of the women in the kingdom to rebel against their husbands. Her punishment was that she could never be in the presence of the king again. This decision sets in motion God’s plan for Esther who would later outwit these men. It’s a shame that a refusal could hurt Queen Vashti so much. We know that she was beautiful, but beyond that the Bible doesn’t say much more. 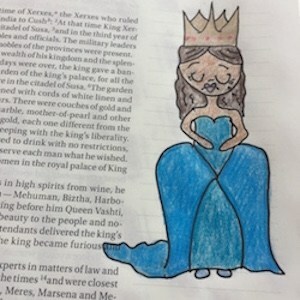 You can read more about Queen Vashti in this commentary. 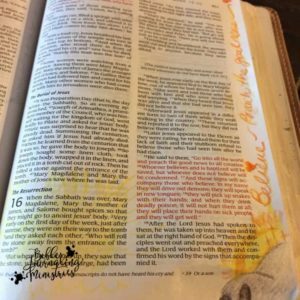 I use digital images in my Bible journaling all of the time. Mostly because they’re beautiful and I know exactly what the image is going to look like when I’ve finished. To transfer digital images to your Bible, you need an image, graphite paper, pens, and your Bible journal. Here are step-by-step instructions, a supply list, as well as a free printable for you to get started. This video shares how to transfer digital images to your bible. 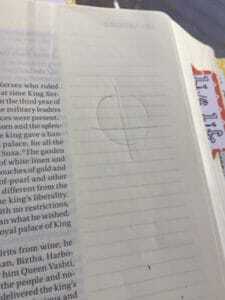 Digital images are perfect for tracing onto your bible using graphite (or carbon) paper. The first thing you’ll need to transfer digital files to your Bible is an image. I offer free downloadabl e templates if you’re on our ministry mailing list. Click here to sign up. You don’t want to miss a single one. You can use our images for personal and ministry use. If you’re not using our images when transferring digital images onto your bible, please make sure you read the terms and conditions of the site that that you’re using. Some designers do not allow you to trace their images. You can print the digital image onto regular copy paper. However, I sometimes like to print it on a transparency. That way I can see the image placement before I trace it. Transparencies also make great templates if you’re teaching a larger group and want to be able to reuse it. Place the digital image onto your Bible. You can secure it with tape, but use a small piece so that it’s easy to remove and doesn’t rip your page. Place graphite paper under the digital image with the dark side down. That’s the side that has the graphite. Using a pen, trace the digital image. You don’t need to press hard, but don’t press to lightly either. 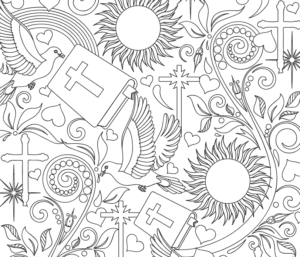 Trace only the parts of the image that you want in your Bible. If you don’t like the transfer, you can always erase and start over. Be sure to check your transferred image before removing the template or tape. That way you don’t have to mess with realignment if you didn’t get it transferred to your liking. If you’re happy, remove the graphite paper and the image template. You should have a nice image to color. You don’t have to outline your image, but it’s something that I really like to do. If you decide to outline it, be sure to use a pen that has a tiny tip. I like Micron pens. After you’ve outlined the image, let your ink dry before erasing the graphite lines. I erase the graphite lines because I find that they blend with my colored pencils. You can now color your beautiful picture. 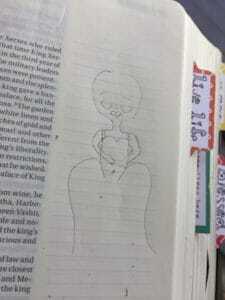 I’d love to see what images you transfer onto your Bible. You can tag me on Facebook at @biblejournaling or on Instagram @biblejournalingministries. Please share your comments below! Here are the supplies I used in this tutorial. I always recommend that you use supplies that you have on hand before purchasing new supplies. Making a purchase by clicking any of the links below supports our ministry. There is no additional charge to you, and you may even save money as I always try to find the best prices. Our ministry receives a small commission on purchases you make with our affiliate links. We don’t accept donations, so this really helps!